We know change is all around us every day shaping our world, often at a tectonic and invisible pace. An exception this week here in Alameda was the rare, raw and rapid change associated with demolition of the William and Susan Illidge home at 3810 NE 28th Ave.
We knew it was going away, this graceful Frederic E. Bowman Mediterranean-style home built in 1922. Last summer we wrote about the plans to raze this vacant beauty and subdivide the big lot in two. We even shared a news story from 1922 noting its recent construction. Still, there is a raw shock and sadness that accompanies demolition. 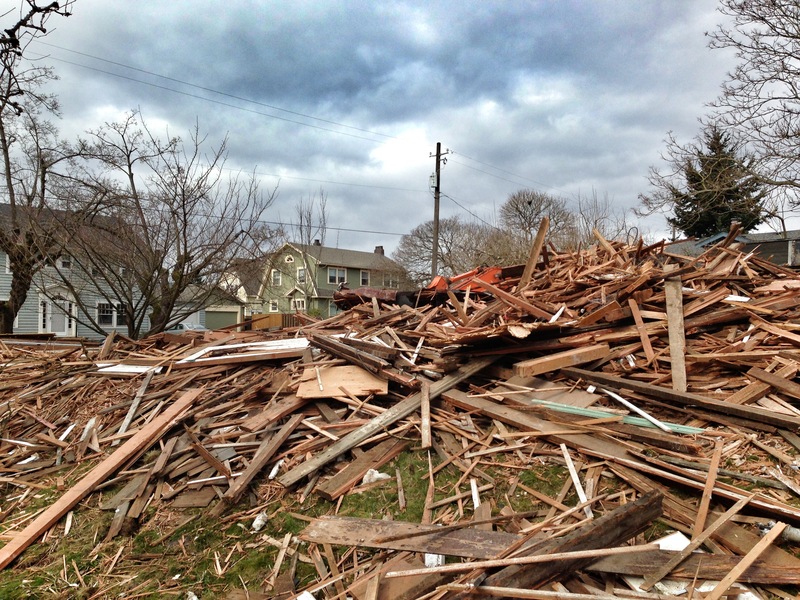 Splayed out on the ground here at NE 28th and Hamblet—and in piles awaiting a truck—are bits and pieces from 90 years of construction and adaptation. Mom’s favorite tiles here and there. A door to the kids’ room. Tons of lath from the era of plaster. Gone now are the favorite places and spaces known by four generations of families. Which—as we stand on the sidewalk surveying the mess and trying to imagine two brand new buildings on this spot—makes us appreciate the time-honored aspects of our own home. And the complicated economics of change. Sorry to see you go, old time traveler. So well said. I’ve hated the thought of this home being destroyed…I so hope this is the rare exception and we don’t experience more building of new homes to replace the wonderful history we have in Alameda. As my daughter and I have viewed possible new homes in Alberta Arts, I am struck by the number of small homes being torn down and replaced by new giants on tiny lots. The character of the neighborhood is being lost. Hope it doesn’t happen here. Here, from 1917, I have a terrific image of deconstruction done with care and respect. Each piece of the house was carefully removed, the windows and the siding and framing stacked neatly, and prepared for repurposing. At least that way the bits of memories were ready for a new life, instead of wasted in the dump, and appearing as if a bomb went off, as in your images. I will send you the image – it’s a much more appealing view of managing change without mayhem. What a shame! Breaks my heart when any old house of merit is torn down. Let’s just hope the new homes going in it’s place won’t be the kind you see popping up everywhere- high front porches with 20 steps leading to the front door, a garage below, no trim details. 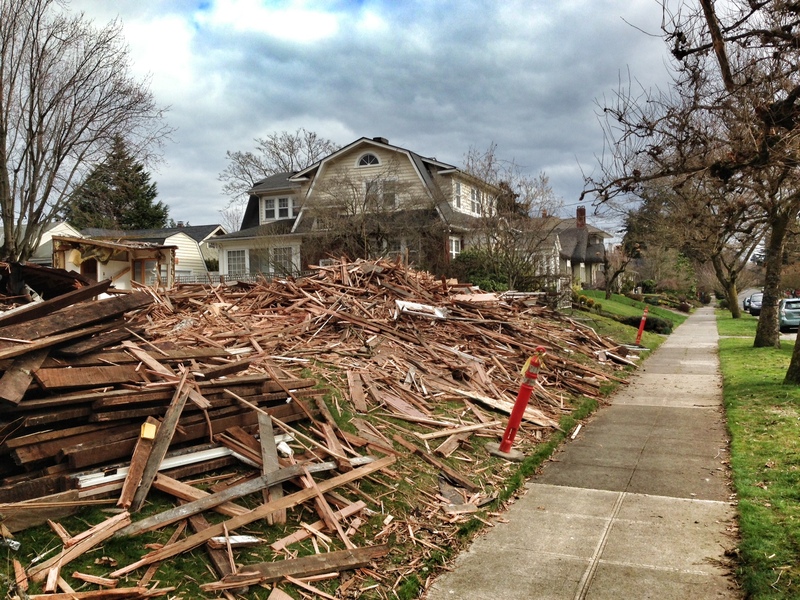 Sad state of affairs for Portland infill. 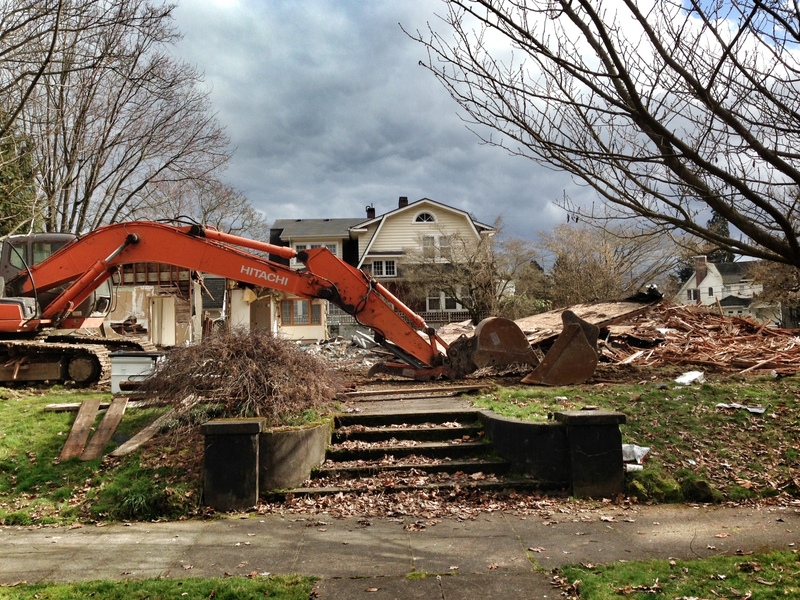 I almost cried when I saw them demolishing this beautiful home. How can we stop this from happening again in our community of historic homes? Something must be done to stop the razing of smaller, affordable homes from being destroyed and replaced with monstrosities that take up every inch of land available. If this is not stopped in Portland, this city will become Menlo Park, CA. Smaller, affordable bungalows were torn down and replaced by mini-mansions. Soon no one could afford a home there because the land became so expensive because of greedy builders who cared little about the character of the town, or the affordability of the home. All over my NE Beaumont-Rose City Park neighborhood great homes are being destroyed by the same housing company that is putting up ugly, huge rental units without parking. Portland is at a turning point. If the City is to remain affordable, vibrate, and accessable, the City Planning Commission has to get it’s act together, or people need to start protesting these behemouths. I have no problem with infill housing per se… it can be done well, even when accounting for contemporary tastes. However, when a perfectly good, historically significant house is torn down simply to maximize the profit available from two building lots — and when what will be built will be simply bad faux versions of historic styles — this is simply the destructive characteristic of greed. It should not be permitted under any normal circumstances. The person responsible for this should be ashamed of himself.